"Dodge City will always be home in my heart...it may be because the house my father, the late John Mueller, began in 1879 still stands, as beautiful as the day it was built," Henry Mueller said when he was in Dodge City the other day. Still trying to decide for sure what brings him back to the old cowtown on every possible pretext, Mr. Mueller, who now lives in Nashville, Ill., said, "You know it may be because I can walk down the streets here, speak to everyone whether I know them or not...even engage whoever I like in conversation...now my daughter is married to a New York physician...and if I did the talking there I do here I'd land in the 'bug' house or the big house, sure. "By the way, that's partly why I keep coming back here...whenever I do the Schmidt's invite me up and I have my day dreams in the old house to my heart's content. "But I promised to tell you about the house...few people realize it took eighteen months to cut and face the rocks that went into it and all of them came from Hodgeman county or up on the Sawlog, and many of them were hauled forty miles. The rocks are two feet thick, even the ones used for the partitions. When my father found the rock so hard he prophesied the house would live as long as the town. "My father was particular about the mortar used...he figured it would have to be good to last with the rock. The lime that went into the mixture was burned in the Zerbie kilns on the Sawlog and Heinie [Schmidt] tells me that not long ago he had a mason go over the house and he remarked that though it seemed impossible the mortar was still hard as steel. "Since he had such lasting material for his house, my father considered the time element in everything else used in its construction...the floor and ceiling joists, for example, are 2 by 14 and only eighteen inches apart. "The fact that my father made some of the finest boots in the whole country brought such famous folks to our house as Wild Bill [Hickok] and Buffalo Bill [Cody]. 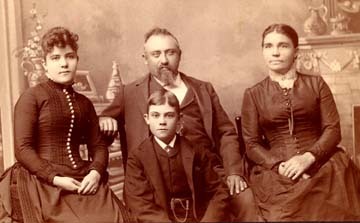 In fact, Wild Bill boarded with us when we lived in Abilene...but that takes me away from Dodge City...."
Return to Ford County Historical Society Main Page or to Dodge City, Kansas history.